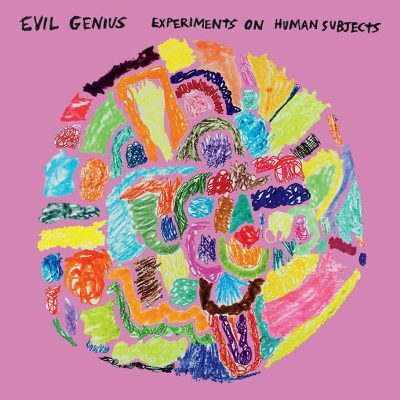 Evil Genius are simultaneously indefinable in relation to most other music and reliably contained in their self-made boundaries. Though Experiments on Human Subjects is only their second release, they already have a unique identity. Outside of the atypical instrumentation of electric guitar, drums and tuba (played by Max Kutner, Mike Lockwood and Stefan Kac, respectively), the trio has established their own musical language and style. It’s easy to parse out some influences and predecessors, but the group smashes them together into a chaotic amalgamation. Few musicians attempt to connect the abandon of free improv with the steady pulses of rock music, the intricate calculations of new music with the wooly textures of fusion. Not only do Evil Genius make these disparate ends meet, but they also pack them all together into concise, five-minute compositions. On their debut, Bitter Human, this area of intersection resulted in an abrasive and unrelenting album. At its best, it was thrilling and boisterous music played by technically stunning musicians. At its least compromising, it was the kind of cerebral art music that only resonates with people who’ve written dissertations about Milton Babbitt. Experiments on Human Subjects offers an attempt at bridging that gap. Amid plenty of moments that sound like a sweat-inducing musical workout, there are times where the trio are letting their guard down. The avant-rock needle leans a little more toward the right here, and the looser moments add a degree of approachableness to the sound without taking away the studied chaos that defines Evil Genius’ music. That being said, the opening track suggests anything but. “Skateboarders Versus Security Guards” is the group at their most concise, calculated and aggressive. The brittle guitar lines, nearly unmappable rhythms and blaring volume make up the most daunting two minutes of the album. If this driving madness turns you off, don’t quit just yet. The rest of Experiments on Human Subjects spreads in a litany of directions, and the remaining moments of disorder are leveled by some of the trio’s best music to date. A direct cause of this is that each member’s compositional style is more distinct here than before. Kac’s compositions tend to be the most verbose and obtuse, as with the winding melodies and unstable rhythms on “An Iron Post in a Velvet Footing” or the virtuosic improvisations laced into the multi-faceted “Arctic Circle.” At the other end of this spectrum is Lockwood’s contribution. Though he only authored one track, it stands firmly apart from the other 10. The sporadic, cluttered arrangements that open “Asterisk” ring familiar, but the bulk of the track elegantly riffs on a straightforward rock idea that sounds like Dinosaur Jr. or Sonic Youth at their dreamiest.